Home » Concrete » Precast & Prestressed » Building Systems » Prison / Correctional Facilities » Building a Prison / Correctional Facility? Justice facilities have varying degrees of security requirements, all of which have some impact on the design of the Precast components. Precast concrete is an excellent building component that is both durable and secure. Thickness of Precast wall components will generally be determined by loading conditions and codes, with a practical minimum thickness for casting and handling considerations. High strength concrete (30mpa) and normal reinforcement provided for shrinkage and temperature control will provide the necessary resistance for security. No special reinforcement is required for security purposes. As a guide, non-loadbearing security walls, such as walls located between inmate cells, may be 4” thick with normal reinforcement for shrinkage and temperature control. Cell walls 6” thick can be used as loadbearing walls. Loadbearing cell front walls are normally 6 to 8” thick depending on how the dayroom floor framing interfaces with these walls. Exterior walls should be a minimum of 6”, but can be in the form of a sandwich panel with a layer of rigid insulation between wythes of reinforced or prestressed concrete as thin as 2”. Floor slab components are usually 4 to 8” thick with load support at the cell front, the mezzanine level slab can cantilever over the dayroom space. 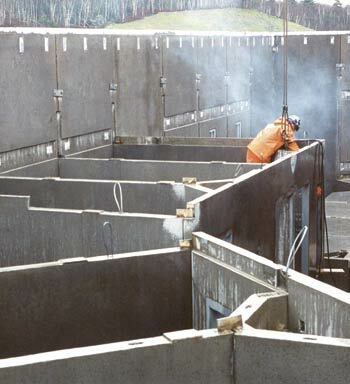 The slabs can have bearing on three sides – the cell front wall or a beam, and the two side wall panels. Normally floor slabs can be conventionally reinforced concrete slabs steel trowel finish on top to eliminate the need of cast-in-place topping or Strescore plank with 2” of topping.